Do you feel like you are usually right? I mean can you imagine. Just think about it. Your employs ask: should we increase our stock? Yes, you say. Should we hire some new staff? Absolutely. Should we remodel our facility? Definitely! Wow! Are you sure you are right about all that? Oh, no, I’m definitely wrong about all that! No, if you’re like me, you have thought through things, had life experiences, and come to conclusions that you think are right. You make decisions based on what you think is right. Now, be honest, do you think that you are right most of the time? Yeah, me too. So, there is a really important corrective to this problem of thinking we are right. It’s called marriage! And this is this what marriage relationship is about. Some of us are right. And the rest of us are husbands. Today, we’re looking at a story about being right, but not being heard. Being right, but being out voted. Being right, but being vetoed. And it’s another one of these great stories we have kinda half heard. Do you remember Joseph of Arimathea? What did he do? Asked Pilate for Jesus’ body, retrieved the body, and gave the tomb for Jesus to be buried. Yeah, that’s what we typically remember about Joseph. We remember what he did for Jesus after his death. But there’s another piece to this story. It’s what Joseph tried to do before Jesus’ death. Let’s look to Luke 23:44-56. The women who had been companions of Jesus from Galilee followed along. They saw the tomb where Jesus’ body was placed. Then they went back to prepare burial spices and perfumes. They rested quietly on the Sabbath, as commanded. So what do you hear in this story? Tell me about Joseph. What does the story say about him? Joseph was the dissenting voice of the Supreme Court. He disagreed, but somehow he didn’t to convince the others. Did he try…and fail? Or was he simply in silent opposition? Maybe he mounted a great lobby to persuade the others, and maybe those tremendous efforts failed. Or maybe he just sat back and let the cards fall as they would. All we know is that Joseph was not in agreement with the rest of the high council and that he was a good man. He was right – like Joanie was right – and yet no one listened – like I didn’t listen. No one heard him. No one followed him. He was on the side of justice and righteousness. And yet he lost. Have you ever been there? Have you ever been right, but also the minority? Have you ever fought for what is right against popular opinion? Or maybe you’ve been on the other side…you’ve agreed it’s popular opinion. You’ve agreed with the majority, but in hindsight you were all wrong? Maybe you were the one to call the shots and you failed to listen to the voice of someone who was right. (Kinda like me with Joanie and my sick children) Maybe you didn’t take someone seriously enough? Maybe your perspective told you something really important, but it wasn’t broad enough to see what was right. Right or wrong, regardless of the outcome, we all have to pick up the pieces – just like Joseph did. Instead, Joseph does something good, something that is about integrity, something that shows forth his heart and his character. He pick up the pieces of a tragedy. 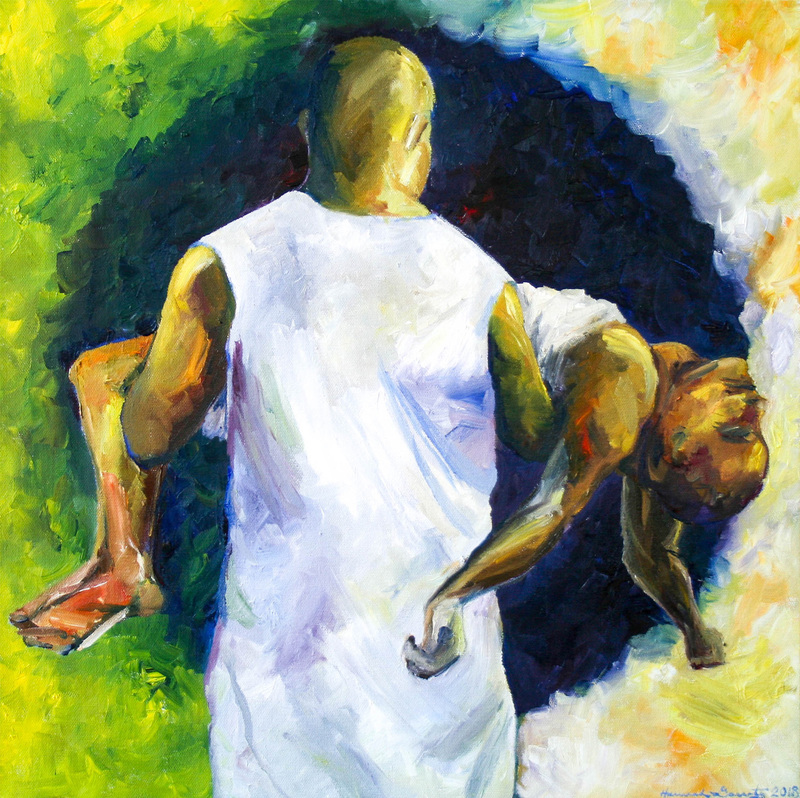 He picks up the now lifeless body of Jesus and offers an honorable place for burial. He ensures that Jesus’ body isn’t just thrown away like other criminals. He gives Jesus an expensive, honorable burial fit for someone very important. Joseph shows us what character is, what being good means. Joseph shows us how not just to be right but how to be righteous. I don’t want to just BE right. I want to try to make things right because picking up the pieces is way better than leaving things the way they are. Picking up the pieces is way better than leaving things the way they are. Whether right or wrong, we all have to turn the page in the book of our life and move forward. We have to work not just to be right, but to make things right. We have to be about joining God in his work to make creation good. Joseph does this in the worst of tragedies. And you can, too…no matter what life throws at you. May each of us have the courage to pick up the pieces in our own lives. To move forward whether right or wrong. To pick up the pieces and do what is good. Amen.